There’s a piece in today’s Guardian about ‘Slow Fashion’, which declares now is the time to buy forever fashion that will last. I don’t think terminally stylish designs with lasting appeal ever really went away and if we are doing what Gok tells us and shopping less but wearing more, that can only be A Good Thing for lots of ethical and social reasons. But from an economic angle, while buying smarter = good for our wallet, buying less = bad for the economy. And to be honest, although I try and shop by the ‘buy less wear more’ mantra. I just don’t buy Slow Fashion as a major trend. This proclaimed Major Step Change towards owning simple wardrobe builders (plus a few key sparkly pieces) is all very well and good – but I don’t see Primark issuing a profits warning. Primark made Fast Fashion affordable. 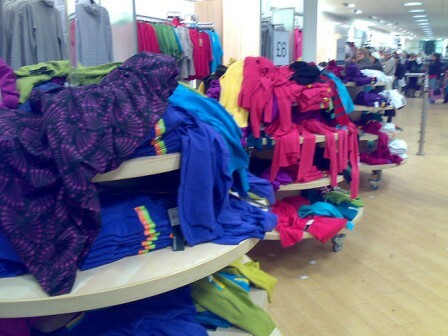 Anyone could walk out with a handful of on-trend tops and still have change from twenty quid. And surely in an economic downturn, buying more stuff for less money is going to seem attractive? I had a big clear out at home recently and took it all to the local car boot sale. I’ve always been resigned to the fact that you’re never going to make much money at these things and have to view it as glorified recycling. But I though a pound for a nearly new top that cost £15 was a reasonable deal – except no-one would take me up on it. Then it dawned on me that you could probably buy something very similar brand new from Primark for just a quid more. Primark and Co not only sell their own goods cheap, they diminish the resale value of the rest of the market. It’s like swamping the market with brand new Skodas that are cheaper than second hand Fords. Charity shops certainly feel the Primark Effect, not only with customers trading up out of Nearly New into Brand New, but even back in 2007 Oxfam let it be know that they’d rather not have your Primark cast-offs to sell, thanks all the same, as they could only charge pennies for them. Until Fast, Affordable Fashion gets less accessible, or consumption becomes seen as more bad than good, Slow Fashion just isn’t going to able to catch up. we sell ethical fashion at ethics girls & we are trying to shift the consumer over to slow fashion but its a hard job! as you say! Thanks for the comment! The formatting on it had gone a bit mad so I tidied it up for read-ability, hope this is OK.
Yep, it’s broadly true that fast fashion isn’t cool amongst the cognoscenti, but what’s true of spoilt Guardian readers isn’t true for the average Primark Warrior. Glamour and Closer haven’t changed their stance one iota, Coleen and their coven are still not be seen in the same outfit twice. Fashion won’t go out of fashion, and girls (and men) will always dream of being as glamorous as the people portrayed in their magazines – if they can, they will.